Two veterans received special recognition during the Veterans Day program in New Haven Sunday. Pictured are Grayson “Pat” Williamson, left, a veteran of the U.S. Army, and George E. Carson, a U.S. Air Force veteran. They were presented American Flags encased in glass presentation boxes. 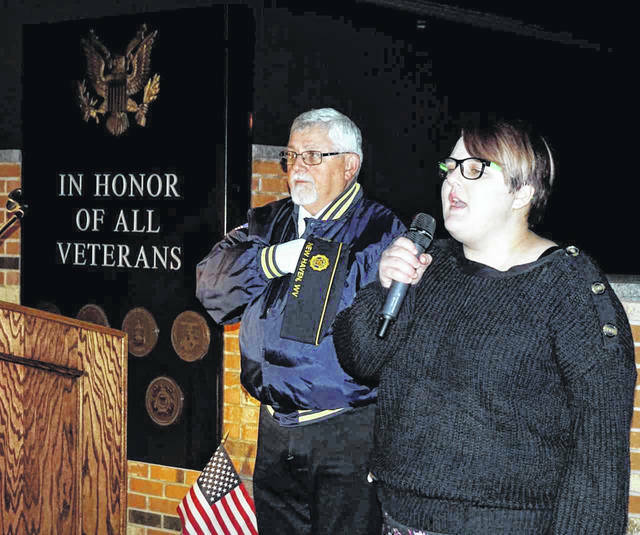 Wahama student Haley King is pictured as she sings the National Anthem at the annual candlelight Veterans Day program in New Haven Sunday evening. In the background is Smith-Capehart American Legion Post 140 member Dave Sigman, who led the service. NEW HAVEN — Accounts of valor and sacrifice filled the chilly air Sunday evening, when the annual candlelight Veterans Day program was held at the Veterans Monument in New Haven. The program was hosted by the Smith-Capehart American Legion Post 140 of New Haven, Stewart-Johnson V.F.W. Post 9926 of Mason, and the Town of New Haven. 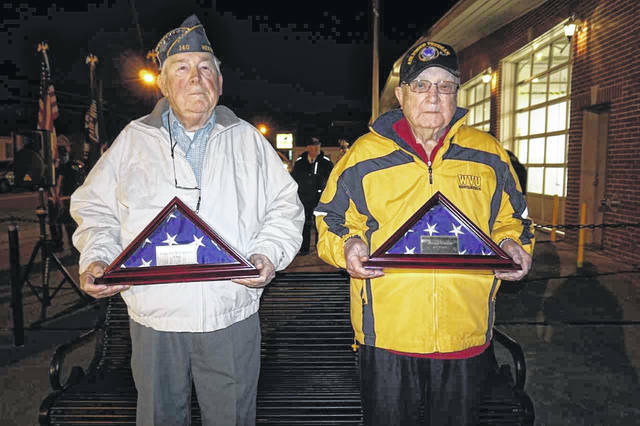 Two Bend Area veterans, Grayson “Pat” Williamson and George E. Carson, were given special recognition. They were presented American Flags, encased in glass presentation boxes. Steve VanMeter of the Drew-Webster American Legion Post 39 of Pomeroy was the guest speaker. VanMeter told those attending that there is real meaning behind the saying, “All gave some, some gave all.” He estimated of the veterans across the entire United States, 90 percent of them would serve again for the freedom of our country if they were asked. Dave Sigman of American Legion Post 140 led the ceremony. He also introduced, and told about, the two veterans who received the special recognition. He said Williamson was drafted into the U.S. Army in 1951. After basic training, Private Williamson was assigned to Camp Gordon in Georgia, and attended cable splicing school. Following his schooling, he was assigned to the European theater as a member of the 803rd Aviation Battalion and helped build B-36 airfields in England. He was discharged in 1953 with the rank of Private First Class and was awarded the National Defense Service Medal and Good Conduct Medal. Following his discharge, Williamson attended business school with the help of the G.I. Bill. He was later employed with the Foote Mineral Company, worked for five years with the WV State Treasurer’s Office, and was a past mayor for the Town of New Haven for 16 years. Carson enlisted in the U.S. Air Force in 1951. After basic training, he was sent to Utah for training as an A&K sighting systems mechanic, and was later retrained in munitions depot operations. Carson was sent to Fairbanks, Alaska, which at the time was considered an overseas duty assignment. He completed his tour of duty there, and was discharged with the rank of Airman First Class in 1953. Carson was awarded the National Defense Service Medal and Good Conduct Medal. After his discharge, Carson worked at the International Nickle Plant in Huntington, then later Kaiser Aluminum, where he was employed for 32 years. He also served as a guard at the Mountaineer Power Plant in New Haven, being employed by the G4S Security Company. The solemn P.O.W./M.I.A. ceremony was presented by Sigman during the program. The service also consisted of a firing squad, the playing of “Taps,” and the presentation of flags. Wahama student Haley King sang the National Anthem, and Ken Vickers of American Legion Post 140 gave the opening and closing prayer.